Senior Placement Services: Why Take Advantage of Senior Placement? Finding the right senior care option isn’t always easy. You’ll find the ideal care option for your needs. Every individual has their own special needs, and the ideal senior care option to meet those needs won’t always be obvious. Whether you or a loved one has difficulties getting dressed in the morning or your loved one is forgetful and constantly wandering off and getting lost, we can help you find the right option for your needs, which is why, before we do anything else, we’ll take the time to get to know you or your loved one. You’ll benefit from experience and knowledge. Senior living consultants, like the professionals at A Right Place for Seniors, have extensive experience and knowledge in the industry. This gives them key insights into all of the options available to you, as well as the providers in your area. Not only do professionals know which questions should be asked to get you the information you need, but they also know who to ask and when to ask them. You’ll save both time and energy. There are many different senior care providers out there, but unfortunately, not all of them are made equal. It can take hours and hours of research to find the right option, which not only takes a whole lot of time, but energy as well. When you work with a senior placement agency, like A Right Place for Seniors, our senior living consultants will do the hard work for you, freeing up your time and energy. You’ll have the resources you need to make the right decision. When you choose to work with your senior living consultants, you’ll have all of the resources you need to make the right decision about you or your loved one’s care. And, while we will help you narrow down your options, at the end of the day, the decision about where to live or which senior care service you choose is ultimately up to you. However, when you are thoroughly informed about all of the advantages and disadvantages of your options, it will give you the peace of mind in knowing that you’re making the right decision. Let A Right Place for Seniors help you find the right option for your needs! 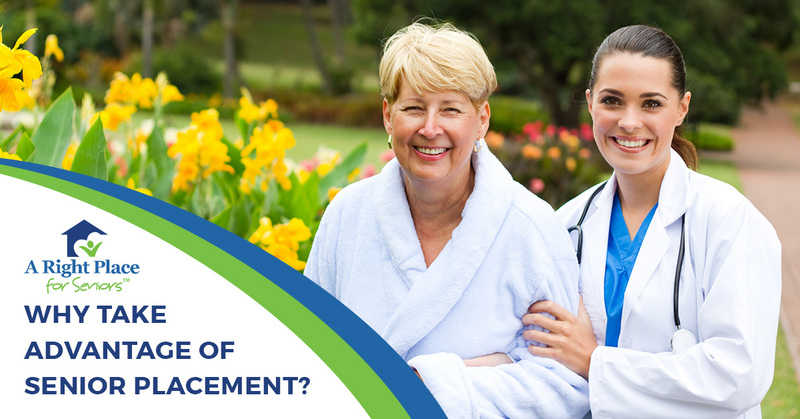 At A Right Place for Seniors, we’re proud to be your premier source for senior placement services. Our senior living consultants help people just like you find a senior care option they can feel good about in cities all across the United States, from San Diego to Palm Beach. Best of all, our senior placement services are 100 percent free! There’s no need to rub your eyes or wipe off your glasses; you read that correctly. When you work with our talented and experienced team, you’ll get all of the resources and tools you need at absolutely no cost to you. You have enough on your plate, and finding the ideal senior care option is too important to leave to guesswork. Let us help to make the process smoother and easier. Find your senior living consultant today.